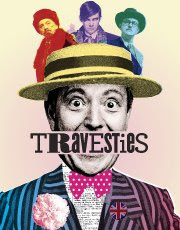 Sydney Theatre Company & HWL Ebsworth Lawyers present TRAVESTIES by Tom Stoppard. At the Sydney Opera House Drama Theatre. TRAVESTIES by Tom Stoppard was first presented in 1974 at the Aldwych Theatre in London for the Royal Shakespeare Company. Stoppard’s work was last seen in Sydney in the MTC’s production of ROCK ‘N' ROLL at the Sydney Theatre as part of the STC season last year. TRAVESTIES is a relatively early play by Stoppard, who is regarded, by some, to be one of the great living playwrights. Each of his plays is highly anticipated and highly debated. Like most of Stoppard’s work this is “History rewritten as fiction (and) it is the motif of TRAVESTIES, a work that exploits the coincidence of (James) Joyce, (Vladimir) Lenin, and (Tristan) Tzara being in Zurich in 1917. Factually they never met, but Stoppard links them through Henry Carr (a minor official at the British Consulate who had a dispute with Joyce) and his involvement with Joyce’s English Players in their attempts to produce Wilde’s THE IMPORTANCE OF BEING EARNEST. He uses Wilde’s play “as a base text, against which his own work is set…. Much of the action is presented through the unreliable mind and narrative of Henry Carr……. Events separated by months or even years are made simultaneous as Carr addresses the issue of ‘whether the words “revolutionary” and “artist” are capable of being synonymous, or whether they are mutually exclusive, or something in between’. The style of the play amalgamates Wilde and Shaw through Stoppard’s efforts to ‘marry the play of ideas to comedy and farce’. This is pastiche, a favourite Stoppardian technique which flatters earlier works through imitation rather than mockery of their style”. “In TRAVESTIES, ideas of art and the artist flit with immense speed across the stage, especially as Tzara (Dada) and Joyce (Ulysses) debate their respective aesthetics….. Act Two begins with Stoppard reversing the lingering humour “with the introduction of Lenin and the theories of Marxism.“ Summing up the entire issue of TRAVESTIES for Stoppard is the question "How does one justify ULYSSES to Lenin? Is it possible?" Some of my audience talking about what they had just seen at the Drama Theatre on Friday evening were having some of the same reactions. It is, however, a testament to the writing that this play is permanently in the repertory of International Theatre and is as popular as it is controversial, still, in 2009. Well loved and oft revived. There is sometimes a shudder away from a work that seems so impenetrable but as recent history has told us when a work of this kind of challenge is presented and DONE WELL, it finds an enthusiastic audience. The STC’s production of COPENHAGEN was not for intellectual slouchers and yet it proved to be a great popular and Box Office success. Build it and they will come. Put it on and we will go. Just ensure it is done well. To this production, then, at the Sydney Opera House: The director, Richard Cottrell, following on from his masterful production of a much lesser work, YING TONG - A WALK WITH THE GOONS, has brought to bear not only his great experience (to read his theatre bio-graphical notes in the program is to humble many a fellow artist), but his intellectual acumen and a loving relish of the theatre; a positive “glorying“ in it!!! The cast he has placed at the service of Mr Stoppard’s text, under his tutelage and care, is fairly well perfect. The design by Michael Scott-Mitchell (Set) and Julie Lynch (Costume) has been calibrated to serve the text and Mr Cottrell’s intentions like a glove firmly on a hand. (My personal taste finds it just too busy, too many visual offers to be comfortable with, with so many words as well.) The Lighting (Bernie Tan) and the complex Sound design (Paul Charlier) are in total harmony; with the sound almost a comic character in its contributions to the fun and textual “pointing.” (eg the cuckoos!!!) The Choreographer/movement (Pamela French) along with the rigours of the Voice and Text work (Charmian Gradwell) must also be acknowledged as successful contributors to solving the traps of this very difficult text. Jonathan Biggins playing Henry Carr, the senile narrator and at other times the young consulate/actor figure gives a highly engaged and engaging performance. The success of the evening hangs on his assiduity. He certainly has the affection of the audience who quickly surrender to his charisma as a performer and trust him to take them safely and clearly on a journey. (The older Carr, on the night I attended was vocally just too muffled in his Englishness and senility to be perfectly comprehended. But so confident is Mr Biggins that I was persuaded to stay with him and keep up. It pays off, but if one was not excited by the play, one might easily opt out of the effort demanded and give up completely, frustratedly.) The command of Mr Biggins interplay with firstly Robert Alexander (Bennett), who I have not seen, recently, as wonderful (watch the dexterity and beauty of his dancing in the finale as well); then secondly,Toby Schmitz (Tristan Tzara) in a series of intellectually superb scenes of scintillating wit and learning is admirable indeed. Toby Schmitz gives a dazzlingly adept and cheeky performance of a very high order. Brain, body and voice in marvellous trim. Peter Houghton (James Joyce) is not quite as on target all the time, but gives an overall picture of Joyce’s interests, if not always a constant accurate detailing. Blazey Best (Gwendolen) and especially a marvellously energetic and accurate Rebecca Massey (Cecily) play the Stoppardian/Wildean demeanours for the heroines, well. The musical duet between the dueling Gwendolen and Cecily in the second act, a perfect delight of audacity. Kept for the last act is William Zappa (Lenin) who in a guise of dour seriousness along with Wendy Strehlow (Nadya Lenin) as an earthing, passionate disciple of her husband and Marx, give the comedy a mordant humour that balances delightfully the frivolousness of all the others combined. Mr Zappa, my favourite Australian actor, is immaculate in timing, gesture and wit. Wendy Strehlow should be watched for the quiet magnificence of her refined and restrained choices that brings a clean sleekness to the ideas of the role. This is as near a perfect company that I have seen on a Sydney stage for some time. (Maybe since YING TONG.) The common element is of course Mr Cottrell. From the moment one walks into the auditorium of his production(s) I feel very safe. 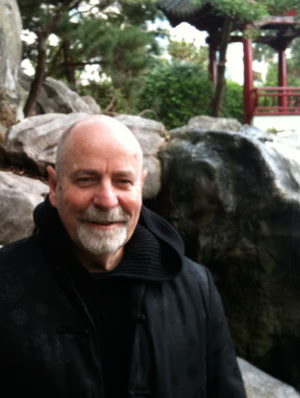 He invites me to prepare and to participate with him and his fellow artists. He has a way to confidently disarm you and surrender to the possibilities of the night. From the pre-theatre curtain to the gentle exit from the standstill of the first moments of the play to the rollicking and restless and relentless pace of his orchestration of the writing, right to the final breathless full stop. This is early Stoppard and in hindsight one can protest the intellectual coolness that his characters sometimes have to, have to work, which sometimes is at the expense of a fully realised human being. Some audience may object that there is not enough reality in the characters. But to quote Wilde from THAT play “In matters of grave importance, style, not sincerity, is the vital thing.” In this gravely important debate of Art, Politics and Revolution the playing in heightened style is of vital importance, to the sustained concentration of the whole. To blur it too much with “the milk of human kindness” might disable the vessel from its objective, which is principally to stimulate and amuse by debate. In the later oeuvre of Mr Stoppard, we see this master playwright begin to balance his heart and brain better. In ARCADIA, THE INVENTION OF LOVE and the monumentally great nine hour play THE COAST OF UTOPIA, Mr Stoppard presents real human beings, suffering as well as being smart and often funny. To see these three plays is to see the full flowering of Tom Stoppard's gifts. TRAVESTIES is an appetiser to his promise, but still in its own right, a great night in the theatre. It is rewarding. He invites you to get on board with him and at whatever level you enter the lists of his challenge, there will be some assured reward for keeping up with him. The better prepared you are for the performance the greater the reward. What you put in, you’ll get out. The Emperor Joseph II is said to have said to Mozart “Too many notes”. Some might say to Stoppard "Too many words." As Lady Bracknell, in a completely different context says "We live, I regret to say, in an age of surfaces." He expects you to work as hard as the artists do. This is not theatre for the somnambulist or comatose. The great gift that Mr Stoppard gives you under the admirable guidance of Mr Cotterell is that you will feel yourself and know yourself to be a much cleverer person then you thought you ever were when the final moment happens. The applause at the curtain call is not just for those artists up on the stage, but for all of us in the auditorium that night as well. We have, if the night worked, done our fair share, and you will know you have. Comedy demands the complete circle of actor/audience communication. Each stimulates the other. The exhilaration of stimulation is a very adrenalin consuming and depleting activity. Certainly you will be provoked to want to know more about what you have just seen. The subtitle to Wilde’s THE IMPORTANCE OF BEING EARNEST is A Trivial Comedy for Serious People. It could just as well be the same for Stoppard’s TRAVESTIES. Prepare for it and don’t miss it. Playing now until 25 April. Book online or call 02 9250 1777. Postscript: The STC program has Mr Tzara being born in 1816, which would make him to be 101 at the time of the play. Mr Schmitz may need a different make up and approach to character -creation!!!!! It also has Lenin dying in 1953, some 30 odd years after the actual date. Now there is a subject matter for Mr Stoppard to play with: The fictional birth and dates of men of history!!!!!!! Meeting where? In Antartica? Thank ou for your review. I can't wait to re-experience Travesties - I saw what must have been the orginal Australian production at the then Nimrod 30 odd years ago and loved it. I indeed left feeling "a much cleverer person then you thought you ever were". I just wish I could remember who was in the cast - maybe Peter Carroll, John Gaden, Anna Volska...? I'm a huge fan of Wilde, and when a friend of mine (older and more experienced in the theatre) said it was playing, he had seen it and it made him feel "simulataneously brilliant and stupid", I knew I had to see it. I understood all the Wilde quotes, and loved the set with the playscript across the top (the set was fantastic, as were the dandy costumes) butm, as i suspect most people did, felt lost fairly often and so sat back and simply observed the actors and the director's brilliance. I agree that the audience had to work hard in this play. I thought it was just me struggling as I did in Part I of War of the Roses, having not read the history plays, but no, you're right. Travesties was quite intellectual, and I was lucky enough to even appreciate the Wildean content. Put it this way. I tried explaining the Cecily/Gwen-do-lllleennn musical showdown, and the muffin joke to two friends the same age, and they just looked at me and said, "it was funnier when it was just about muffins." So I suppose whether you were a serious or a silly theatre goer, you enjoyed Mr Stoppard and the cast as much as anyone.